If you haven’t heard of the GFree Radio Show*, it is a UK based weekly podcast, run by broadcaster Peter Stewart. *June 2015 update: the GFree Radio Show is no longer operating and the podcast (episode 91) has been removed. He interviews all sorts of people connected with the gluten free world – producers of free from products or shops, bloggers with travel tips (UK and overseas), editors of gluten free magazines and apps, reviews of products, people talking about their experiences living with coeliac disease and experts such as the allergy advisors who work with the EU allergen legislation. 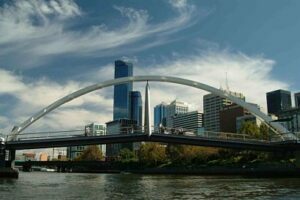 I was interviewed regarding my 100% gluten free Melbourne (Australia) post. We have a bit of a chat about how I got diagnosed and generally manage with coeliac disease and also places I have travelled to (from 1.23 – 14.48 mins), but most importantly we talk about how my home town of Melbourne can be great for people with coeliac disease (from 19.19 – 37.40 mins). Happy travelling and if you need any advice about visiting Australia, please feel free to contact me via the contact form.